Pre-washed cotton blue denim bedding and all the accessories to create a classic bedroom for kids or adults. Complete bedding sets in both a duvet and comforter style. Modern lines provide sleek style with pipe detailing. 3 color choices include Purple, Khaki and Black. Sets provide everything you need for a complete bedroom makeover: Comforter or Duvet, Shams, Bedskirt and 3 accent pillows. Ikat bedding sets include comforter, duvet or coverlet and 2 pillow shams. Reversible - Ikat dot design on reverse. Cotton. Machine washable. 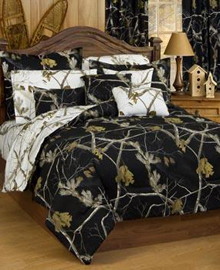 The AP Black and White Camo pattern is a Realtree All Purpose high definition camouflage bedding design. This design keeps the same depth, contrast, and detail as the original AP pattern which is lighter and more open that other patterns. The comforter is over sized and over stuffed, black on one side reversing to the same patter on a white background. Made of cotton and polyester blend for warmth and durability. 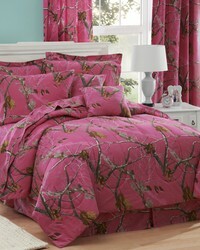 Realtree APC Fuchsia bedding for creating a pink camo bedroom. This beautiful spa inspired, luxury Arlington comforter set includes a solid cream colored comforter, 2 linen like pillow shams and a coordinating seafoam dust ruffle. Coordinating and matching accent pillows, curtain panels and throw blankets are also available to enhance the look of your homes decor. Black and dark tan bedding. Collection includes accent pillows, shower curtain, euro shams, duvet cover and comforter sets. Bear accent pillows make this a country set or leave out the bear details for a more sophisticated look. Lovely blue green blends to form a sensous sea mist color for a soft and gentle floral bedding ensemble that includes everything you need to make your bed. Comforter - available in queen, king and california king - 2 shams, 1 bedskirt and 3 decorative pillows. Jaquard paisley classic bedding sets available in two colors: classic black and silver or blue, taupe and platinum. Duvet sets includes 2 shams and 3 accent pillows. 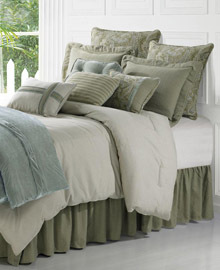 Comforter set includes comforter, shams, decorative pillows, sheets, bedskirt and euro shams. Rustic and Transitional. This 4 and 5 piece comforter set includes a printed and faux leather comforter, matching pillow sham(s), neck roll pillow and coordinating faux suede dust ruffle. Accent pillows, valance, throw blanket and euro shams also available to complete this look. Tranquil hues of blue-green create a relaxing bedroom retreat. A modern medallion on a polyester jacquard fabric that is machine washable make this a bedding ensemble just for you. Bedding set includes comforter, 2 pillow shams, bedskirt, and 3 accent pillows. 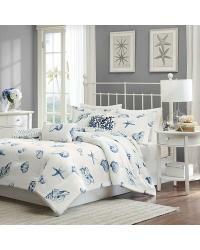 Coastal style bedding set made of 200TC cotton sateen is machine washable. Starfish and sea shells in light and dark blue on an ivory background with a taupe coral motif bring the beach into any room. Comforter and shams reverse to same dark blue. Complete bed-in-a-bag set includes comforter, shams, bedskirt and 3 decorative pillows. Coverlet set does not include bedskirt. 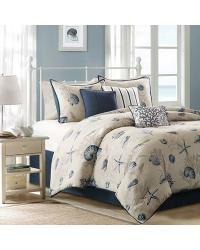 Casual bedding features sea shell pattern in shades of blue on a white, cotton brushed twill. 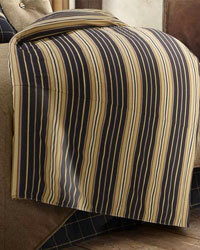 The duvet/comforter is fully reversible, reversing to a Yarn-Dyed stripe in blues and white. The duvet/comforter is oversized and machine washable for easy care. Bear Trail Bedding This gorgeous reversible quilt set features a forest scene complete with bears, trees and mountains. Choose from twin to queen and king sizes complemented with hues of brown, tans, green and deep red. Reverses to a beautiful tan plaid. Jacobean floral bedding set in muted teals, chocolate, and linen colors. The filled duvet and standard shams feature edge piping and flanges. Euro shams are quilted from the same chocolate micro-suede as the adjustable bed skirt. All three decorative pillows feature embroidery. Bedding Blackberry Sets feature textural woven stripes that create the perfect canvas for your bed. Mix and match with decorative pillows sold separately to create your own look. 3-piece comforter set includes comforter and 2 pillow shams. Featuring the recognizable Bone Collector brand skull, this black bedding set is a great choice for the hunter as well as fans of the design, which is found in a popular TV show. The comforter's fabric features a black background with the white and gray Bone Collector logo on one side and when reversed a gray background with the logo being in black and a darker gray. Make your bedding complete with a sheet set that also sports the trademark logo. Pillow shams along with accent pillows and curtains with coordinating valance help finish the look. The black Bone Collector bedding is available in twin, full, queen and king sizes. Hunters everywhere recognize the Bone Collector brand. For the serious hunter, Michael Waddell and his number 1 hunting show are at the top of the list. The classic dear antlers and skull are displayed prominently on this brown bedding set which offers a comforter, shams, coordinating accent pillows and sheet set. Available in twin, full, queen and king sizes the Bone Collector bedding set is sure to be a hit with your hunter. Super soft microsuede in red and shades of brown. Complete bedding ensemble includes comforter, shams, bedskirt and 3 accent pillows. 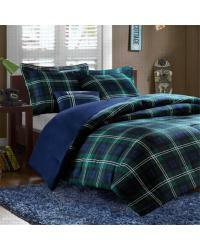 Blue and Green plaid comforter set includes comforter, sham(s) and decorative pillow. Available in Twin/TwinXL and Full/Queen. Machine Washable. 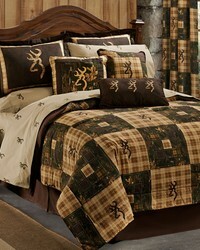 Classic Browning Buckmark bedding sets. 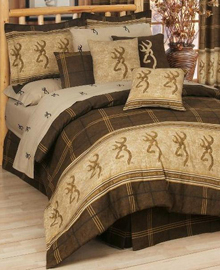 The legendary Browning Buckmark deer is an instantly recognizable symbol of the outdoor lifestyle and is featured on this brown and tan bedding set. 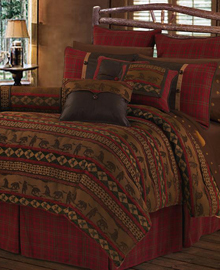 The Browning Buckmark comforter set features a oversized/overfilled comforter set, matching plaid bedskirt and plaid Browning Buckmark pillow shams with the famous deer logo. 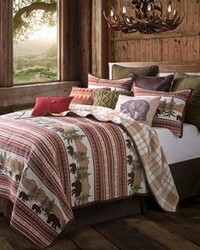 Also available in this deer bedding are the matching sheets, pillows, curtains and valance. MADE IN THE USA. 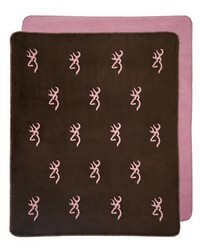 The Pink Buckmark is a feminine interpretation of the easily recognizable and famous Buckmark deer logo by Browning. This pink deer bedding offers a brown and pink comforter and shams that are fully reversible offering two completely different looks. This pink Browning Buckmark comforter set includes a pink and brown reversible oversized comforter, brown bedskirt and matching reversible shams with the deer logo. Complete the look of your bedroom with matching sheets, throw pillows and curtains with this pink deer bedding.. Pink and brown Buckmark bedding accessories. Pink and brown plaid bedding sets for your home. 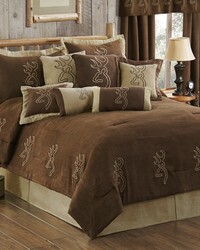 Brown Suede with the Browning Buckmark bedding sets and accessories for your home. Browning in a country plaid style for creating a room you will love. 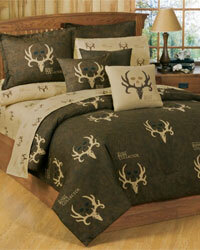 Subtle, classic good looks sum up Brownings outdoorsman-friendly hunting bedding featuring a whitetail deer. 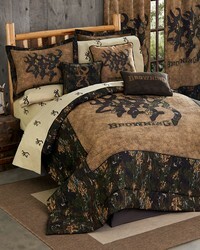 The Browning Whitetails bedding set features a striking deer collage accented by the bold Browning logo. 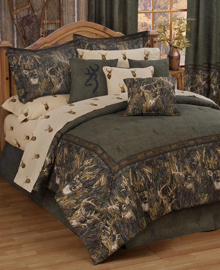 The Browning Whitetails comforter collection includes an oversized/overfilled comforter, matching bedskirt and whitetail camouflage pillow shams. Accent pillows, curtains, sheets and more are also available to complete the look of your hunters bedroom. Embroidered faux silk bedding is luxurious, yet machine washable. Complete bed ensemble includes comforter, 2 shams, bedskirt and 3 decorative accent pillows. Pink camo bedding and accessories like pillow, curtains and more. The Caldwell western bedding set features a tooled leather comforter with hair on hide, faux leather fringe and concho accents. This western themed comforter set includes comforter, 1-2 sham(s), decorative neckroll pillow, and coordinating dust ruffle. These amazing textural combinations make a perfect addition to any room. Modern plaid bedding set. Taupe and blue vertical stripes meet red stripes on a blue base for a unique design. Two decorative pillows feature piecing and twill tape details for added dimension. 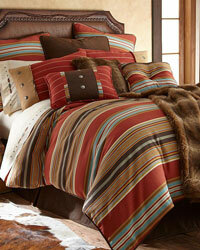 Calhoun southwestern style striped bedding and decor. Rich red is paried with aqua and shades of brown to create a palette that is distinctive and stylish. 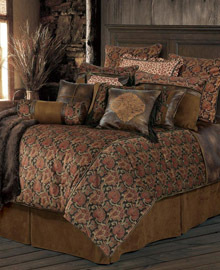 The Cascade Lodge bedding set is a rich chenille bedding that is accented with bears and pinecones. This luxurious lodge style comforter set includes comforter, 1-2 pillow shams, accent pillows, neckroll and matching bedskirt. Choose from a variety of matching accessories including euro shams, accent pillows, throw blankets, curtains and coordinating bed sheets to help complete the look of your room. Chalet Aztec Bedding in it's earth toned colors offers twin, full, queen and king sized comforter sets that are very luxurious to sleep in but without the price. Gray fleur-de-lis bedding. Hurry while it lasts. Modern design made from polyester microfiber, the bright aqua color and geometric design bring your space to life. Coverlet is quilted. Sets include sham(s) and decorative accent pillows. This casual bedding ensemble is available in two colors: blue with brown, grey with black. Microsuede provides a super soft feel while the pintuck details add to the look. Create a crisp, modern bed with this greek key design embroidery in steel gray on crisp white cotton pique. Classic and timeless bedding set. 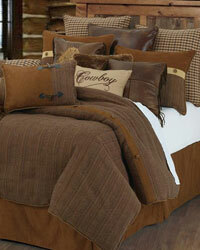 Cowboy bedding set and decor. Classic houndstooth paired with faux suedes and faux wolf fur for a truly western look. Traditional grey and white plaid combined with a small plaid and button detailing give this a finished look. Bedding sets include comforter, sham(s) and decorative pillows. Shabby chic paisley bedding set includes everything you need. A mixture of soft blue, periwinkle, and hints of green are printed in a paisley design alongside pintucked blue fabric that is separated by lace taping. A ruched white flange around the edge. 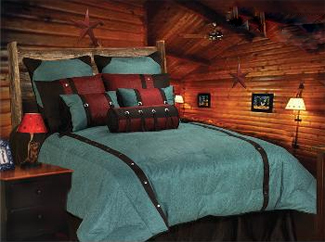 The Del Rio comforter set is a tooled leather bedding set with southwest accents. This rustic western comforter set includes a beautiful faux leather comforter, pleated fabric dust ruffle, matching pillow sham(s) with a unique diamond design and a luxurious accent pillow to pull the look together. Coordinating pillows, sheets and throws also available. Ruched white bedding set is soft and billowy. Duvet cover set includes duvet cover, 2 shams and 1 decorative pillow. Graceful ducks depicted on this warm and inviting bedding ensemble. 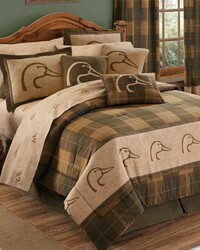 Classic Ducks Unlimited bedding set paired with a warm brown plaid. Casual microsuede bedding set. The soft, micro-suede fabric has pleating details to add dimension and texture to the duvet. The soft Khaki color is accented with a rich chocolate brown. Modern style can be found in the intricate metallic embroidery, the pleated sides and textured fabric. Soft taupe duvet cover is made of polyester. Bedding Sets - Duvet Cover Sets & Comforter Sets from budget to Luxury all for decorating your homes d�cor. This section includes duvet covers, comforters, shams, bedskirts, throw and decorative pillows with matching bed sheet sets in a variety of themes and colors at discount prices.